That’s one of my favorite sentences in the book, The Art of Good Habits by Nathalie W. Herrman. In The Art of Good Habits, you’ll begin with a mass of thoughts, consider them, pare them down until you get to the essence of the matter. You have to first be honest with yourself about who you are and what you want. Only then can you start going after it. That’s the principle of change discussed here. I’m reading an Advance Reader’s Copy right now, compliments of NetGalley.com, and it’s awesome. I can’t wait for a printed version so I can make read the whole thing and put my notes in the margin, etc. There’s a lot of work-book type exercises in the book, lots of questions we need to ask ourselves so we can learn what we really think about things, not what we think sounds good when we talk to others. The book’s approach is based on 4 pillars – honesty, willingness, awareness and appreciation. Step 1: Write an honest paragraph, detailing some of the struggles you have with food – whether you eat too much, whether you deprive yourself and then binge, whether you see food as negative and eat only because you have to or whether you eat too fast – whatever the issues, be honest and write them down. Step 2: Review the paragraph and summarize it in 2 sentences. Step 3: Review those 2 sentences again and come up with one honest statement that describes your issue. That single statement is the problem and only when you identify that problem, can you work at a solution. 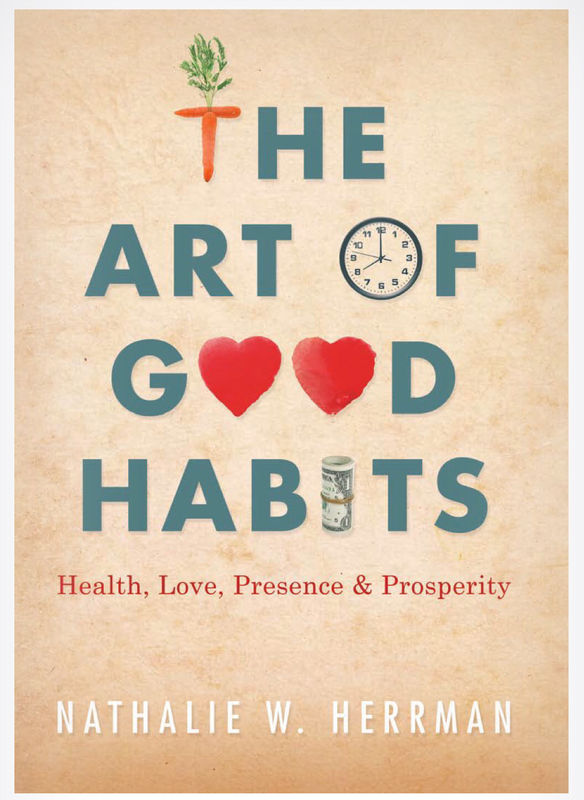 The Art Of Good Habits is due out in December and I’m looking forward to to making it part of my Christmas gift choices. Sounds like a good read. I like the idea of being still and taking in the moment. We don’t get to do enough of that in our fast paced lives and I regret it. Especially in NY it’s almost impossible. I remember when I was in college I would take the subway to go home and one day I found myself having fallen asleep with my head on the shoulder of the person who was sitting next to me. Very awkward. It is this type of exhaustion we should try and avoid. Sorry if I went off topic but when I read your blog I let my mind wander free. It’s a good feeling. Have a great weekend. Thanks for your thoughtful and motivating comments, Mary. I have been the one in the train that someone fell asleep on my shoulder and you’re right, it’s awkward but we’ve all experienced that tiredness so most times, it’s funny and embarrassing but not such a big deal. If you check out the book, let me know. I am nominating you for the Blogger Recognition Award. It is up to you if you accept it or not. I just wanted to let you know that I enjoy reading your blog very much and that you have been appreciated. I will be posting about this on Monday. Aww, thank you. I will definitely accept it. Thanks. It was a great introduction. I read The Happiness Project and loved it but didn’t get to her other book(s) yet.